If you’ve ever been to the Kite Museum here in Jakarta, you know that it is an enchanting place where you can make your own little kite, as well as learn about the history and practice of creating the paper creatures. The beautiful open spaces and pavilions which allow hordes of school children and tourists alike, space to learn the craft, sat dormant after business hours. 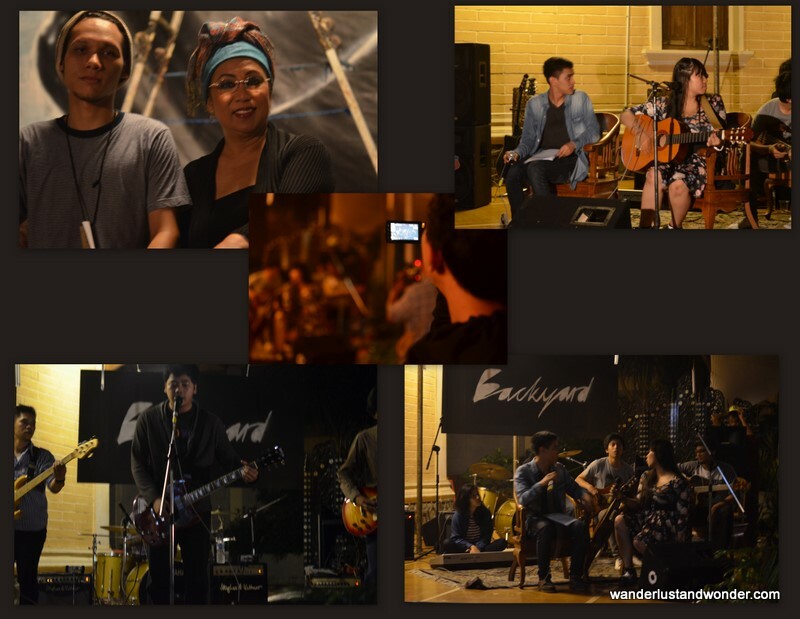 But, the potential to turn this largely open space into a venue for artists to showcase their work did not go unnoticed by the owner of the museum, Ibu Endang Ernawati, or her son Radityo Puspoyo. Thus Backyard was born. Aptly named, as this lush space sits in back of the museum’s main office. 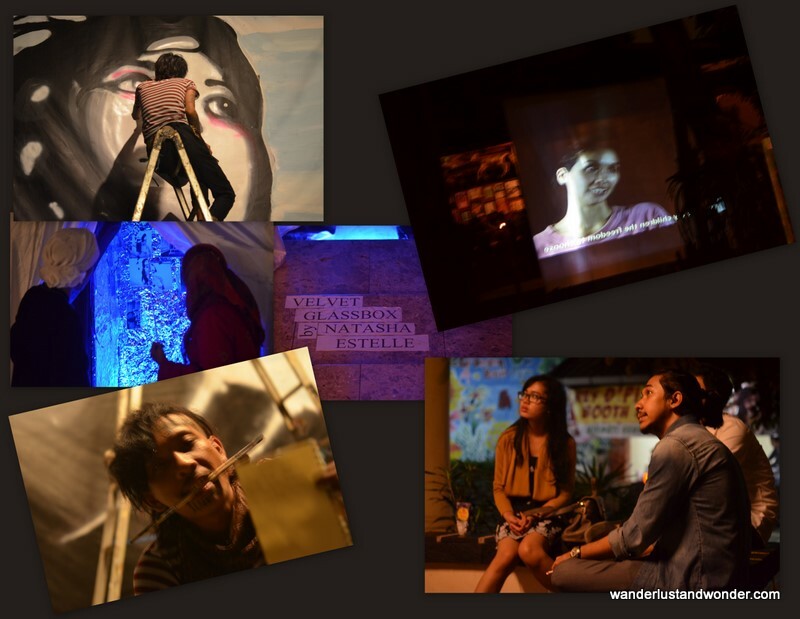 Last Saturday, Backyard held its second opening, titled Jendela Eksibisionis (“Window Exhibition”) and featured short-film screenings, Music by Freedom of Choice, MySecretIdentity and Sapphira Singgih, as well as Paintings and installations by Rizal Fadillah, Priyanto P. and Natasha Estelle. 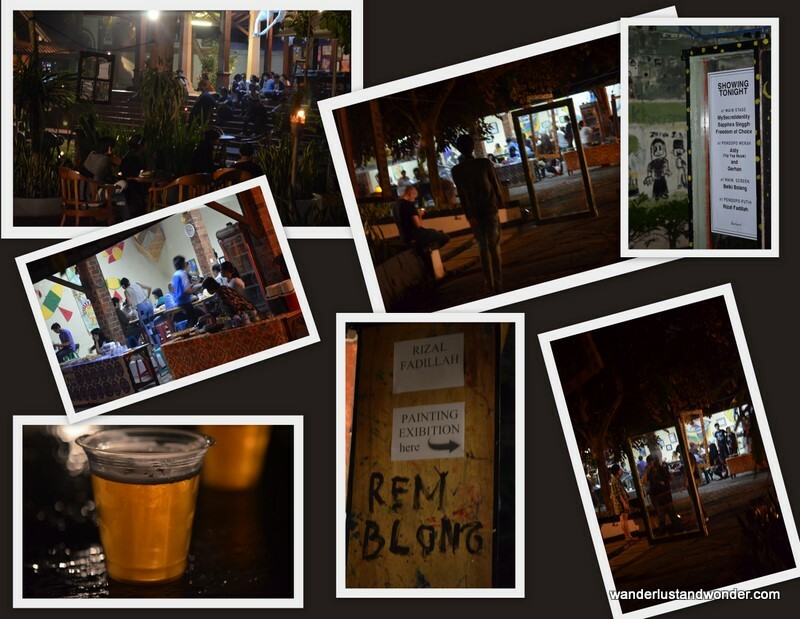 It was a multidimensional event with something for everyone, and cold beer to keep the heat at bay. Laced through the trees were windows of all kinds each decorated in a unique style. These windows were formed out of found objects and discarded window frames and gave the venue a whimsical charm. While the main Pavillion held Rizal Fadillah’s exhibition titled, Mudah Retak! (“Frangible!”). 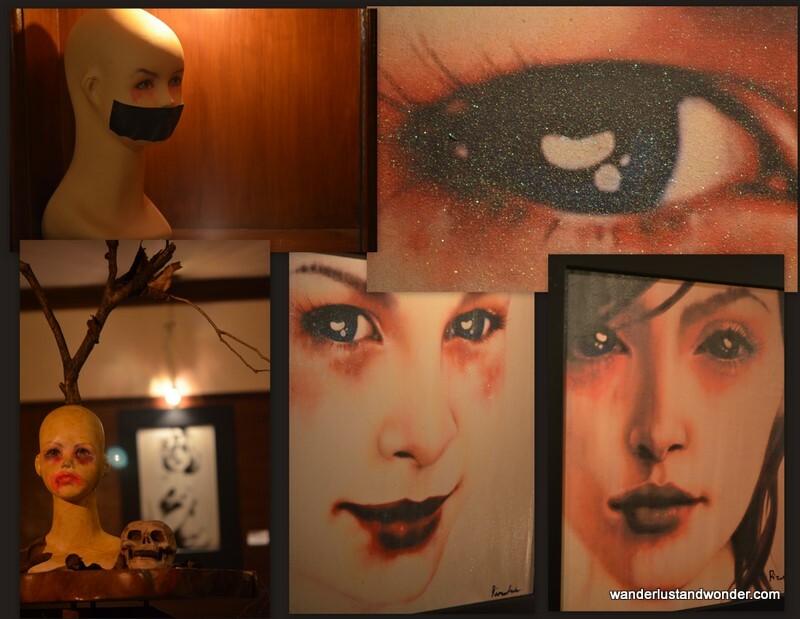 The mixed media paintings were dark and haunting portraits of young women in pain. With a focus on the eyes, because as Rizal explains, “The eyes can’t lie” each girl conveyed the profound agony of suffering a broken spirit. “Everyone is breakable” noted Rizal. And the concept that one who is emotionally broken, will in turn feel useless, is one that runs deep in each work. Rizal confided, “Before you paint you must cut off your head, and use only your heart”. This emphasis on emotion and concentration on communicating extreme anguish produces a visceral response in the viewer, who can’t help but vicariously experience the subject’s inner torment too. While his paintings communicate emotional pain, his installations deal with the physical side of suffering. Rizal’s mixed media sculptures concentrated on the kind of suffering that is specific to women. Graphic and violent in nature, these works consist of mannequin heads each damaged and manipulated in an unsettling yet symbolic way. Cracked or broken, impaled or half buried, these mannequin heads speak of human cruelty and the dark side of the female experience. 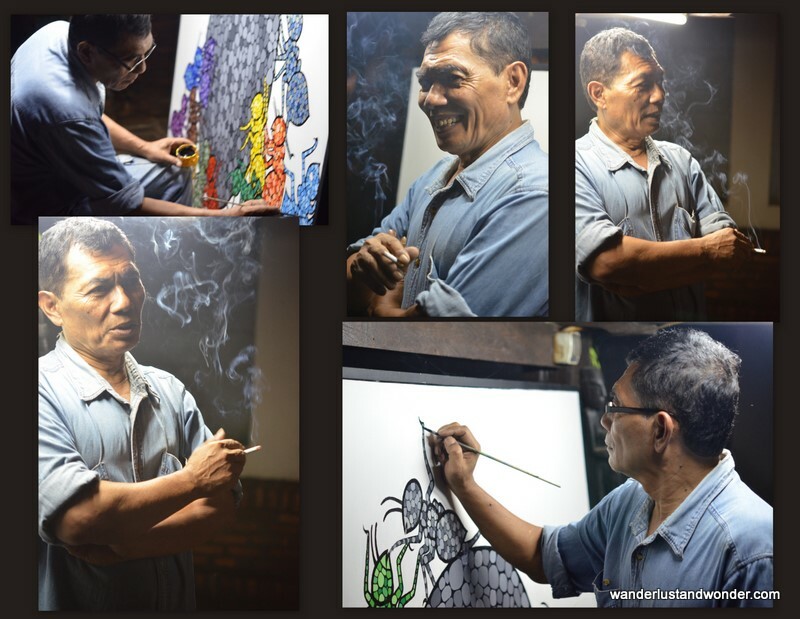 Priyanto, who is Museum Layang Layang’s resident artist, focused on lighter subject matter for his work . Inspired by nature, the acrylic painting depicted ants working communally to convey the notion of “Gotong Royong” (working together). This work too spoke of the human condition, here articulating that by working together for a common good, much can be accomplished. 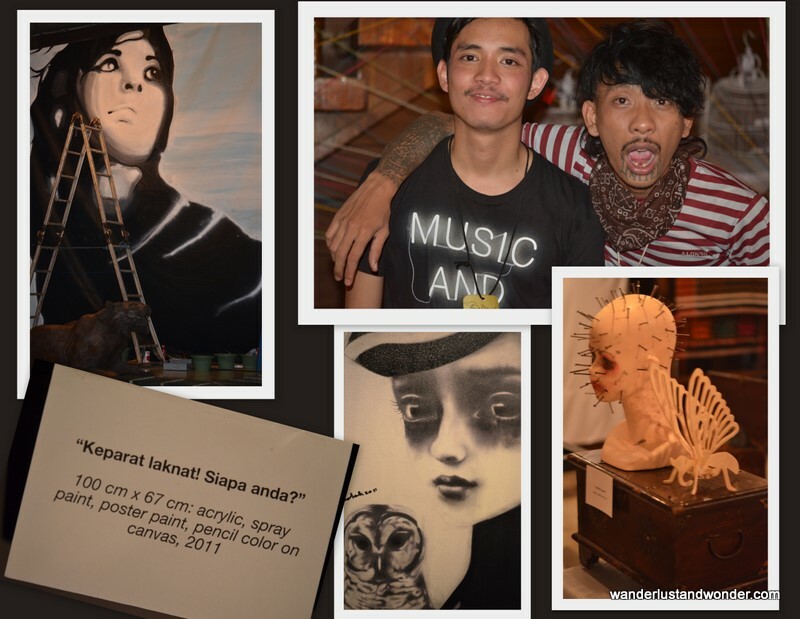 And much was accomplished at this exhibition, where the soulful artworks combined with the sultry ballads by Sapphira Singgih and melodious rock by MySecretIdentiy, and remarkable short films, proved a great way to spend a saturday night. Ibu Endang Ernawati & the bands. I don’t know how you do it….with each posting I am taken on another adventure! I was provided so much insight as to the artists’ soul and I wanted to hear the sultry sounds…I think I could feel the heat and almost felt quenched by the sip of beer. A great experience and I can’t wait to see where we….oooops ….I mean, where you go next. Thanks for taking me with you. Congratulations on your first article being out! I assume that has to do with your blog. Is that right? Blog expands your horizon, doesn’t it? Keep it going!